TJC graduate, Mitch Andrews, attributes much of his success to Tyler Junior College. In the fourteen years since his return, he has worked to repay the favor as one of the architects of the colleges’ future. Andrews’ father, an All-American football player at TJC, later came back to take the Apache Football Head Coaching position. He met Mitch’s mother, an Apache Belle, in 1952. In 1981, Andrews enrolled at TJC to compete with the state’s longest-running and nationally recognized speech and debate program. On the first day of freshman orientation, he had no idea that meet the woman whom he would eventually marry. 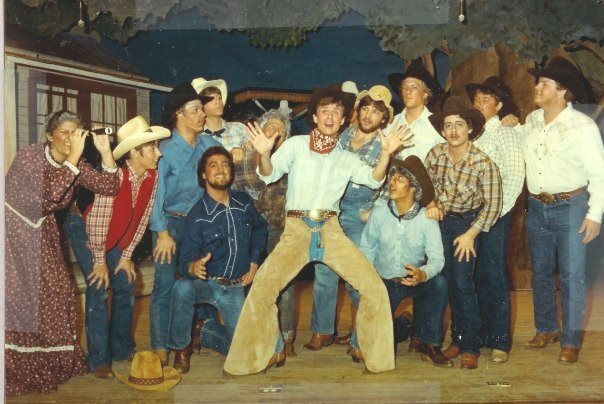 During their time as students at TJC from 1981-1983, 35 years ago, things were a lot different. Genecov was not yet built, nor the OHPE Center, and the Wise Cultural Arts Center, at the time, was a new facility. The Center for Earth and Space Science was there, but it was actually called the Hudnall Planetarium. Weinerland, the fast food restaurant on Fifth Street across from Jenkins Hall was there, but it was called Der Weinerschnitzel. Gentry Gym was where the Rogers Student Center is and there was no student center at the time. The closest thing to one was a building that stood where the White Administrative Services Center now stands called the Tee-Pee, which is where students would get their books. Everybody had cars because gas was so cheap, as was insurance, and parking was easy. There were no computers, so students couldn’t register electronically. Instead, they would walk around Jenkins Hall with a registration card that had to be signed by each professor. “My scholarship covered everything except for $5. I had like a $150 scholarship,” said Joan. “If we paid $20 for our books, we were shocked,” said Mitch. Once it was time to transfer, Mitch and Joan both found handsome offers from the University of Mississippi. – Still only friends at this point, they both decided to attend Ole’ Miss. “They waived out-of-state tuition and put scholarships on top of that. They practically paid for us to go to school at Ole Miss, and what an incredible experience it was. But that’s all because of TJC,” said Mitch. “For some reason, people have this misconception that going to a junior college is going to be easy but it’s like, you will be prepared for classes when you go in and because of those small classes at TJC your instructors have really had their chance to put their hands on you,” said Joan. Both attribute all of their success to the committed professors that they had more than 30 years ago. “It’s not about pulling a paycheck, its really about helping students. And really making a difference,” said Mitch. “Most places you go, if you sink or you fail, nobody really cares. Here, professors work with you, because that’s what the culture of TJC is- that the students are successful for life. And that is exactly the same. That has not changed at all,” said Joan. Some of the same professors Joan and Mitch had are still here today, 35 years later. “One thing that distinguishes us is the longevity of professors here, being here forever. That’s been a really interesting experience for me. Coming back and standing next to what used to be my professors and now I’m standing next to them as peers,” said Mitch. “I had some mentors here that I get to work with every day now so that even makes it more fun. It makes it, almost like full circle, that I’m working with the people that made such a difference in my life,” said Joan. The couple was married in 1990 when they moved to Atlanta. “We were in Atlanta for about 12 years. Then the call came to come home. We really felt a pull to come back to Texas and to Tyler,” said Mitch. Mitch was hired as Director of Principal Gifts, simply defined as developing relationships across the community for people to give significant contributions to the college. TJC has grown substantially even just since the two returned to Tyler in 2002, and plenty of this growth can be attributed to Mitch. Most recently, just after the holidays- Mitch was appointed the position of Interim Executive Director of Institutional Advancement and the TJC Foundation. The TJC Foundation is a separate non-profit organization that supports Tyler Junior College. The foundation has over $47 million in assets, which mostly comes from one large endowment that supports students, faculty, and programs at TJC. “It’s rewarding to me as a former student to see so many in the community, alumni, corporations, and individuals, that are just friends of TJC come forwards and be so generous in supporting the college and helping it to grow,” said Mitch. For Mitch and Joan, who began their adult lives at TJC, to choose to return and spend over a decade and counting here, proves their appreciation. They both believe that TJC is not just unique to the area or state, but to the country in many ways by establishing the right standards and traditions almost a century ago, and diligently working to preserve those fundamentals today. “It was very different and, in many ways, it’s exactly the same. The culture is exactly the same. There are more programs, more bells and whistles, but fundamentally, I think what makes TJC great is exactly the same,” said Joan.